As hope of finding any more survivors dimmed, the official death toll after a magnitude 6.0 earthquake rocked central Italy reached 290 on Aug. 29. The quake and over 300 aftershocks devastated the homes and lives of thousands of people in the early hours of the morning of Aug. 24. At least 400 people have been injured, over 2,000 are without a home and an unknown number at press time were still buried under the ruins of their homes in mountain villages. A massive rescue operation involving over 4,000 civil protection workers and firefighters had managed to save the lives of a large number of people, including children. Pope Francis expressed “his heartfelt sorrow and spiritual closeness” to all those hit by the powerful earthquake. He offered his prayers at the beginning of his weekly public audience in St. Peter’s Square on Aug. 24. Putting aside his prepared text, he invited the thousands of Italians and pilgrims present to join him in praying the rosary for the earthquake’s many victims. The Vatican later announced that Pope Francis had sent a team of six members of the Vatican City State fire brigade to a particularly hard-hit community, Amatrice, “as a concrete sign of his closeness” to the people there. They will join the Italian civil protection rescue effort. 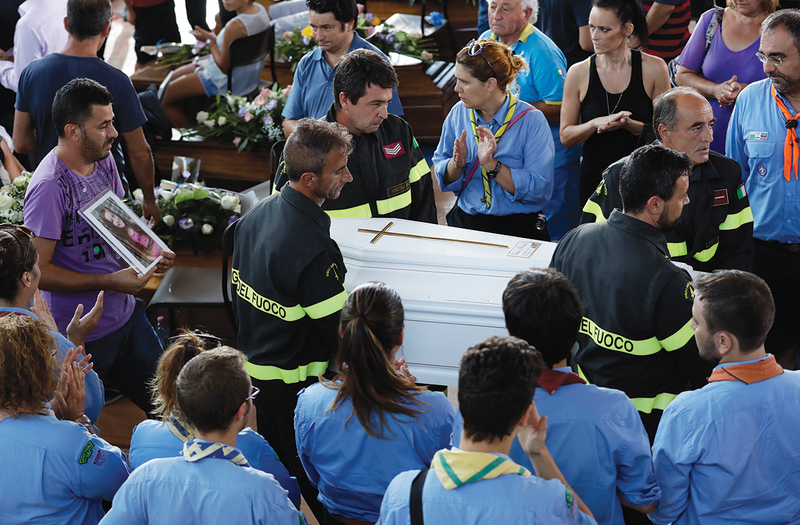 Italians followed distressing and emotional scenes on television, as heroic rescuers worked against the clock to save many young and old—in spite of lesser earthquakes, including one of four-plus magnitude—and wave after wave of aftershocks. Central Italy’s sorrow and pain are great. The stories of heroic deeds of rescuers, and of ordinary men and women, are great, too. One particularly moving episode captured by local media involved one desperate father, who on being alerted to the earthquake, drove immediately with his wife through the night from Rome to Pescaro del Tronto. He succeeded in finding and, with the help of rescuers, saving his two boys—Samuele and Leone—who had been buried under the rubble of their collapsed home. They were saved also thanks to their grandmother, Valentina, who got them to get under the bed when the earthquake started. Another moment that brought great joy came 17 hours after the earthquake, when firefighters managed to extract 4-year-old Giorgia Rinaldo, who was buried under her destroyed house. Sadly, they could not save her 9-year-old sister, Giulia, who was discovered shielding her younger sister in an embrace. A school that had been fortified against quakes just four years ago crumbled in the now obliterated town of Amatrice, raising many questions for Italian investigators who are looking into concerns that shoddy construction material may be partly to blame for the high death toll. The Italian church has already donated one million euros to the relief efforts, and on Sept. 18 a collection will be held in all the churches across the country to raise money to help the victims of this latest natural disaster, whose epicenter was just over 100 miles from Rome. The Civil Protection Agency, helped by a variety of associations, is setting up tents to provide food and shelter to 2,000 people in the stricken zones. But fear of more tremblers is widespread throughout central Italy, where so many have died and where many homes, public buildings and churches are no more. This article also appeared in print, under the headline "Suffering and Heroism After Quake," in the September 12, 2016 issue.